G Suite for Education is a great platform for giving students feedback on their work. The apps in G Suite are also great for facilitating student collaboration. Let’s look at how teachers can use G Suite for student collaboration. G Suite allows sharing in which collaborators can receive edit access. Collaborators can also receive “Can comment” access that allows for commenting in a doc, spreadsheet, presentation, or drawing. Email collaborators is a great way for collaborators to communicate about a file they are working on. The person initiating the conversation need not open Gmail. They also get to choose the exact collaborators they want to send a message to. Click File>>>Email collaborators… to use this function. Use the comment function and type a “+” or “@” with a collaborator’s email address to assign them an action item. That pushes an email to their inbox telling them they have been assigned an action item. Assign an Action Item using Comments. In the Google Docs editor, notice the pencil in the upper-right corner. Click it and choose “Suggesting” in the drop-down menu. Suggesting Mode in the Google Docs editor. Make edits. They appear as suggestions. Collaborators can accept or reject suggestions. Accessing Version History in Google Docs. Create a post that shares files only with group captains. Each group captain can then share their files with their group members. Create posts only for groups. This is not that difficult because of the reuse post feature. Use it to use the same post for each group with slight adjustments for each group. For more information on differentiation in Google Classroom, please watch this video. If your district uses iPads or Play Store enabled Chromebooks, your students can use the Google Jamboard app or Jamboard web app. This online collaborative whiteboard is the new frontier in G Suite collaboration. Have a look at me demonstrating it on my Chromebook. For more information about Google Jamboard, please look at my Jamboard professional development resources. Thank you for reading. 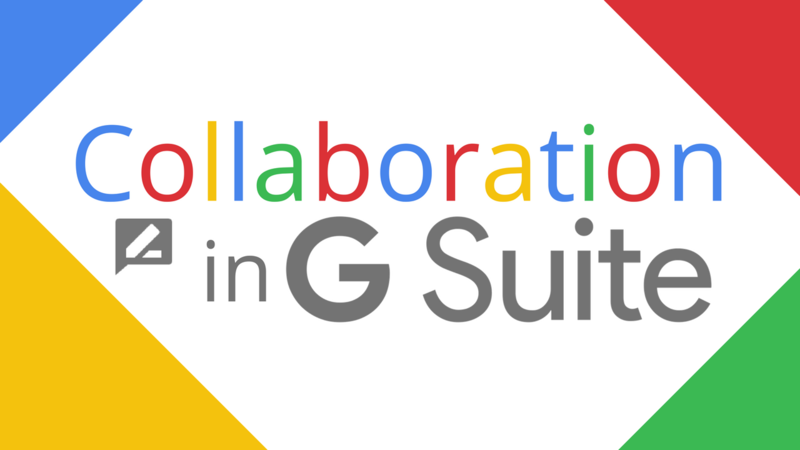 If you would like to share your thoughts about collaboration in G Suite with me, please comment below or tweet me at @TomEMullaney.